I don't know what's with me today but I'm craving for a lot of food. At first, I wanted a fresh garden salad. 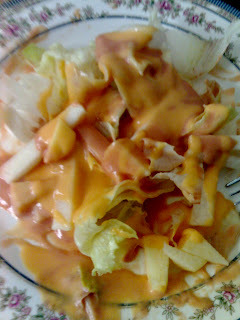 My mom made one for me...lettuce, cheese, turnips, cucumber and apple with a thousand island dressing-Yummy! Then, my dad said that he'll be going out of our village to buy something. 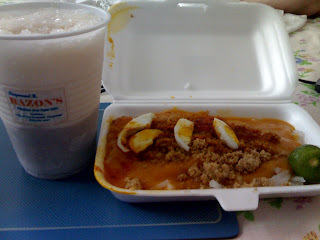 Hmm, I want some Halo-halo and palabok from Razon's! After 30 minutes or so, my dad's home already and viola! My Halo-halo and palabok is there! Super yummy! Hah! And now I'm sooo full. I can't eat lunch now. I haven't slept yet since I arrived from work this morning. My mother dear doesn't want me to sleep yet 'coz I'm full daw and baka di daw ako matunawan. Anyways, Im just gonna surf the net and blog til I drop later. Heeehee.